The invention of scanning tunneling microscopy (STM) in 1981  and later atomicforcemicroscopy(AFM)in1986facilitatedbreakthroughsinvarious disciplinesofsciencesuchaschemistry,physicsandbiology,andtrulyboosted the development of nanoscience and nanotechnology. These two techniques made it possible to achieve a detailed understa- ing of chemical and biological systems as well as phenomena across multiple lengthscales, and in particular downto thesub-nanometer scale. In fact STM and AFM are not simply microscopy tools, but they are also extremely useful techniques tochemistand biochemists. Forexample AFMandSTMoffers- theticchemiststhechancetoobservethemoleculestheyhavesynthesized,how theymoveand dance onasurface,howtheyrecognizeand communicate with each other, thus making it possible to cast new light onto the molecular int- actions. Alongsidetheircapabilityofgeneratingartisticthree-dimensional pictures with nanoscale resolution, they also allowed the study of molecular based architectures beyond imaging, providing quantitative insight into va- ous physico-chemical properties  For instance, by manipulating molecules individually it is possible to bestow information onto their mechanical pr- erties andtoperformconstructionsonthenanoscale. In thelastfewyears the application of AFM and STM to study molecular systems in various envir- ments (e. g. , liquid, gas, vacuum) is paving the way towards the unraveling of complex characteristics and phenomena of nanostructured (bio)systems. 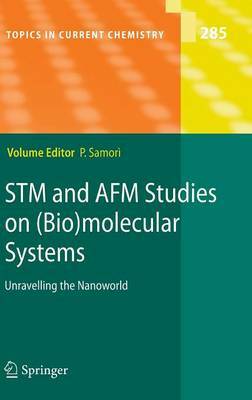 Inthisvolumewehaveselected afewofthemostrelevantexamplesofAFM and STM based experiments on (bio)molecular based systems, which offer not only a close look into the nanoworld but also provide quantitative insight into various properties of molecular and polymeric systems, and ultimately highlight some technologicallyrelevant applications. I was delighted and felt privileged to work with an outstanding group of contributingauthors:Itrulythankthemforalltheirefforts. Iamalsograteful to Dr. Marion Hertel and Birgit Kollmar-Thoni for their invitation to edit this volume and for their assistance.